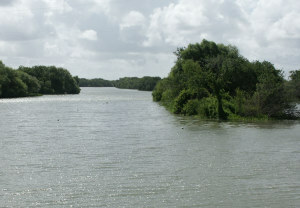 The human history of the Guadalupe Bay site is closely tied to its natural setting at the head of San Antonio Bay, a short, narrow secondary bay that takes its name from the Guadalupe River. Archeologists often emphasize how local landscapes changed through time, but few sites in Texas are situated in such a dynamic locale. Due to sea-level change and the remodeling power of the combined Guadalupe and San Antonio rivers, the immediate landscape encountered by the aboriginal peoples who visited the site was seldom identical from generation to generation. Their campsite lay on higher ground overlooking the upper stretches of the bay and the Guadalupe River delta. Simple dugout canoes would have given them ready access to a rich array of resources from the the salty open bay, to the brackish upper bay, to the freshwaters flowing down the rivers, as well as from the dry and marshy lands flanking the waterways. The geology and landscape of the Texas coastal plain, and the lower Guadalupe River/San Antonio Bay region in particular, has been shaped by the waxing and waning of Pleistocene-age continental glaciers (1.8 million to 10,000 years ago) and the subsequent rise in sea level over the last 10,000 years. Modern sea level was reached between 3,000 and 2,000 years ago. Over geological time, sea level dropped as the glaciers advanced and rivers adjusted their gradients to a lower base level and a more distant shoreline. Across the coastal plains, Texas rivers cut relatively deep and narrow valleys within their former broad floodplains, and extended their courses out onto the continental shelf of the Gulf of Mexico. As sea level rose with the retreat of the glaciers, the narrow late Pleistocene river valleys filled with Gulf waters, forming extensive bay systems. The rivers once again adjusted their gradients and formed new meander belts and channels within the old valleys. Eventually, as the rivers deposited enough sediment into the bays, new floodplains and deltas formed, either partly or completely filling the bays with sediment. Today’s San Antonio Bay is in an intermediate stage of this cycle. The advancing or “prograding” delta of the combined Guadalupe and San Antonio rivers has only partly filled the upper portion of the bay. In order to interpret more fully the archeological data of the area, a brief review of the various landforms, their underlying sediments, and their suggested genesis and age, is needed. 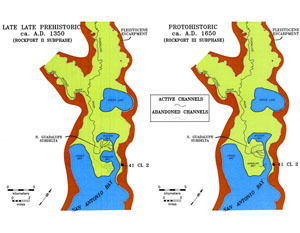 The key landscape features and geological formations include: (1) the Pleistocene-age Beaumont Formation, (2) the probable late Pleistocene, Deweyville-related eroded margins of San Antonio Bay, Green Lake, and the floodplains north of the delta, and (3) the Holocene floodplains and delta of the Guadalupe and San Antonio rivers. 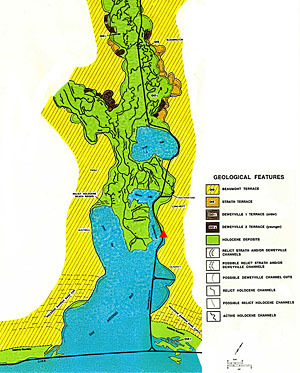 The oldest geological unit in the area is the Beaumont Formation. It underlies the upland that encloses the floodplains of the Guadalupe and San Antonio rivers, their combined delta, and the several bays that are subdivisions of San Antonio Bay (such as Guadalupe Bay). On a regional scale, the Beaumont Formation occurs in a vast arc that parallels the northwestern Gulf coast from a point east of the Holocene floodplain of the Mississippi River in Louisiana (where the Beaumont is called the Prairie terrace), to northeastern Kleberg County, Texas, where it disappears beneath the sands of the South Texas Sand Sheet. Most of the Beaumont was deposited as an overlapping group of alluvial or deltaic plains by the ancestors of most of the modern rivers now draining into the western Gulf of Mexico. The Beaumont on the northeast side of San Antonio Bay was deposited by an ancient course, or “paleo channel,” of the Guadalupe River. On the southwest side, it was deposited by a paleo-San Antonio River. The age and stratigraphic position of the Beaumont (especially its place in the sequence of Pleistocene fall-and-rise sea-level cycles) is of considerable interest to archeologists because there are many sites in the lower Guadalupe River valley that rest upon the Beaumont surface. Most geological authorities suggest that the Beaumont Formation formed between roughly 125,000 and 70,000 years ago, although younger parts of the formation may date as late as 43,000 to 23,000 radiocarbon years ago. The surface of the Beaumont Formation rises from less than 5 feet above sea level near the Gulf coast to greater than 30 ft along the margins of San Antonio Bay. In the vicinity of the Guadalupe Bay site, the top of the Beaumont is about 10 feet above sea level. The margins of San Antonio Bay, Green Lake, and the floodplains of the Guadalupe and San Antonio rivers appear scalloped in many places, as if nature had used a giant cookie cutter to form the edges. Most of these curving segments are formed by the underlying fluvial topography resulting from ancient river terraces and channels. In the bay area and along the eastern margin of Green Lake these curves may have, in part, formed by shoreline erosion during and after attainment of present sea level. However, the curves just north of Green Lake on the Guadalupe floodplain and along the southern margin of the San Antonio River floodplain, as well as some of the curves along San Antonio Bay, have radii of curvature much greater than the meanders of the present-day Guadalupe and San Antonio rivers. These curves may be related to the channel scars of abandoned meander loops that formed within the floodplains just north of the area under study. Similar fluvial-related features that have larger (by at least three times) radii of curvature and channel width than present-day streams in the Gulf coast have been referred to as “Deweyville” terraces. Where the Beaumont Formation flanks the Holocene floodplain, remnants of Deweyville features occur on an intermediate surface or terrace that is located below the Beaumont surface but above the Holocene floodplain. It is important that we refine our knowledge of the Deweyville terraces since they were in existence throughout much, if not all, of the period of human occupation in the Gulf coastal region, and, on the basis of present archeological data, were extensively inhabited. As [geologist Roger] Saucier…notes, this is probably because Deweyville is everywhere ‘the first terrace (and hence the highest ground) bordering long stretches of the Holocene floodplains of the rivers. 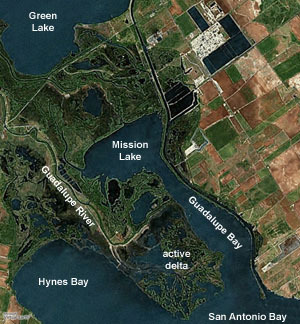 The Guadalupe River delta is located directly across Guadalupe Bay from the Guadalupe Bay site. As such, its development over the past several thousand years played a key role in determining the types of aquatic environments located in proximity to the site and the various resources available to the people living in the area. For that reason, an understanding of the chronology of the delta and its various subdeltas is a critical aspect in interpreting the various prehistoric occupations known from the Guadalupe Bay site. Overall, geologists have divided the delta into two major parts: an older, “Old River” delta whose deposition enclosed Green Lake, and a younger segment, the “Guadalupe” delta, that partly encloses Mission Bay and is active today. Unfortunately, there are no radiocarbon dates available that can be used to accurately determine the ages of the two main deltas or any of their associated subdeltas. Geologists have hypothesized, however, that the delta began to invade San Antonio Bay about 2,000 years ago, a best-guess estimate. Until radiocarbon dates are available from the delta proper, it may be archeological data from sites in the region that best help determine the ages of the various subdeltas. Nevertheless, the relative sequence of subdelta growth south of Mission Lake has been fairly accurately determined. The adjacent graphics illustrate the approximate sequence of development of the various lobes and subdeltas over the last 2000 years. This sequence began with progradation of the “Guadalupe River-Big Bayou” subdelta along the western side of the modern delta area. This subdelta continued to prograde southward, eventually splitting into two lobes, one of which was abandoned, while the other split again. The latest and current subdelta is known as the “Traylor Cut” subdelta, which formed (and continues to form) due to the recent dredging of the Traylor Cut between the Guadalupe River and Mission Bay. This relative sequence of delta building plays an important part in deciphering the story of the Guadalupe Bay site. The climate of Calhoun and Victoria counties is humid and subtropical and controlled predominantly by maritime conditions, such as warm and moist air masses originating over the Gulf of Mexico. Winters are mild, with average daily temperatures ranging from a high of 65.5° F to a low of 45.8° F. Spring is pleasant, with relatively moderate weather that includes temperatures averaging between a daily maximum of 90.8° F in June and a minimum of 62.6° F in April. Rainfall averages about 36 inches annually and typically peaks in the late spring and late summer and early fall. Summer is perhaps the most diverse season with both low periods of rainfall (in July) and high periods (in September). Thunderstorms and other disturbances also produce periods of excessive moisture. Summer average temperatures range from a daily mean high of 93.6° F in August to a monthly mean low of 71.3° F in September. It is also primarily during the late summer that hurricanes and other severe tropical disturbances may trace paths through the region. Fall is mild and moderate, although temperatures fluctuate between a mean daily maximum of 83.2° F in October and a mean daily low of 46.5° F in December. Overall, the region would have offered its prehistoric and early historic inhabitants a mild, relatively stable climate that could support year-round occupation. Live oak (Quercus virginiana) and pecan (Carya illinoensis) trees dominated the upland areas along the lower Guadalupe and San Antonio rivers. Also present were sugarberry (Celtis laevigata), yaupon (Ilex vomitoria), and hawthorn (Crataegus spp.). Additional species, such as anaqua (Ehretia anacua), Brazilwood (Condiaia hookeri), and hackberry (Celtis laevigata) formed motts on small knolls atop the Beaumont Formation overlooking floodplains, and these often mark the locations of archeological sites. Grasslands adjacent to the woodlands along the upper portions of the Victoria Barge Canal may have consisted of gammagrass (Tripsacum dactyloides) and switchgrass (Panicum virgatum). Indiangrass (Sorghastrum nutans) and little bluestem (Schizachyrium scoparium) also were important species found in area. Other “tallgrass” grasslands may have included little bluestem (Schizachyrium scoparium) and brownseed paspalum (Paspalum plicatulum). The floodplains of the Guadalupe and San Antonio rivers likely included water oak (Quercus nigra) and live oak (Q. virginiana), along with stands of post oak (Q. stellata). Other species that probably occurred on these floodplains included swamp chestnut oak (Q. michauxii), willow oak (Q. phellos), water elm (Planera aquatica), and swamp privet (Forestiera acuminata). The marshlands adjacent to San Antonio Bay along the lower reaches of the Victoria Barge Canal were composed of numerous grasses and associated species: smooth cordgrass (Spartina alterniflora), marshhay cordgrass (Spartina patens), glasswort (Salicornia bigelovii), saltwort (S. virginica), gulf cordgrass (Spartina spp. ), saltgrass (Distichlis spicata), and rushes and sedges (Juncus spp.). The animal communities inhabiting this region are just as diverse and abundant as the floral communities. The four main habitat types of the region (open prairies, bottomland hardwoods, estuaries, and coastal marshes) supported various numbers of economically important species. Principal among these were whitetail deer (Odocoileus virginianus) and bison (Bison bison), although many smaller species of mammal were hunted and trapped by the prehistoric inhabitants of the area. Guadalupe Bay and the adjacent coastal marshes are home to an abundance of finfish and shellfish and provide feeding, spawning, and nursery areas. Chief among the marine fish are several species of drum that include black drum (Pogonias cromis), and red drum or redfish (Sciaenops ocellata), plus spotted sea trout (Cynoscion spp. ), and sheepshead (Archosargus probatocephalus). Also present in the upper bay and delta area are various freshwater species including channel catfish (Ictalurus punctatus, flathead catfish (Pylodictis olivaris), and gar (Lepisosteus spp.). 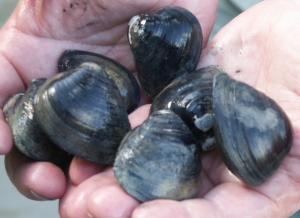 Although a wide array of shellfish species were available in the rivers and bays of the region, two species stand out as primary sources of food: the eastern oyster (Crassostrea virginica), found in moderately saline habitats, and common rangia clam (Rangia cuneata), found in brackish-water environments. The prairies and bottomland hardwoods also provided habitats for a variety of reptiles and amphibians that were exploited by the prehistoric groups in the area. Resident birds are plentiful across the area, while migratory waterfowl are abundant during the winter months, including ducks and geese. Today Aransas National Wildlife Area on the southwest side of San Antonio Bay is world reknown as the winter home of the highly endangered whooping crane (Grus americana). 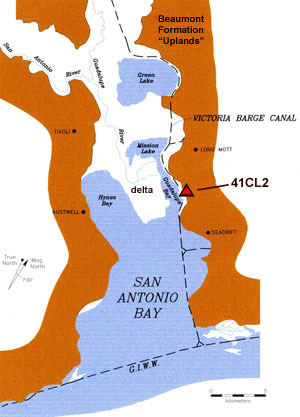 The Guadalupe Bay site, 41CL2, is situated on the eastern shore of Guadalupe Bay, a subdivision of San Antonio Bay into which the combined Guadalupe and San Antonio rivers drain. The head of San Antonio Bay and the prograding (building) river delta is a very geologically young and dynamic landscape that continues to change with major flood and storm events.. CEI graphic adapted from Weinstein 2002, Figure 1-1. View of eastern shore of Guadalupe Bay near the archeological site. 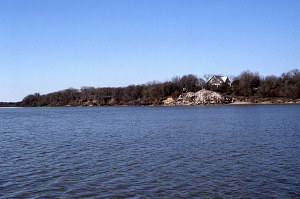 The house visible in this picture is built on the Beaumont Formation, the surface of which begins about 10 feet above sea level, rising farther away from the water. TARL Archives. Geomorphology of the lower Guadalupe River valley and San Antonio Bay. The dynamic nature of the landscape is revealed by the complex maze of relic and active stream channels. CEI graphic adapted from Weinstein 1992, Figure 2.7. Aerial view of the Guadalupe Delta area showing the major bodies of water mentioned in the text. Base image, Microsoft Virtual Earth. 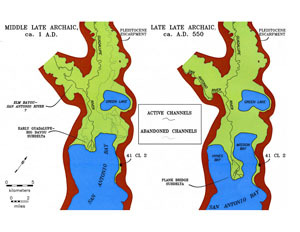 Inferred development of the Guadalupe delta and upper San Antonio Bay area from about the middle part of the Late Archaic period 2000 years ago (A.D. 1; Aransas II) to the Late Archaic (A.D. 1550; Aransas III). Adapted from CEI graphic. Inferred development of the Guadalupe delta and upper San Antonio Bay area from about the late part of the Late Prehistoric period 650 years ago (A.D. 1350; Rockport II) to the Protohistoric period (A.D. 1650; Rockport III). Adapted from CEI graphic. Rangia clam collected along the shore of the Guadalupe Bay site. Early in the site's history, oyster was the predominate shellfish, but during most of the Late Prehistoric (Rockport phase) rangia clams are far more numerous. This change is consistent with the inference that Guadalupe Bay became more brackish through time. Photo by Steve Black. Goff Bayou, one of the many channels formed as the Guadalupe delta prograded (built) seaward over the last several thousand years. Photo by Steve Black. 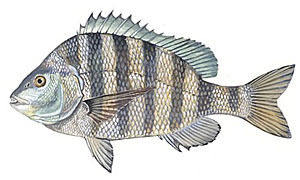 Sheepshead (Archosargus probatocephalus) was the most common fish species recovered from the Aransas phase (Late Archaic) deposits at the Guadalupe Bay site. This species thrives in the shallow waters of the San Antonio Bay system and can tolerate brackish water. Its distinctive black and white coloration, shape, and habit of feeding on mollusks and crabs in very shallow water, would have made it an easy target for spear fishing. Image courtesy the South Atlantic Fishery Management Council.